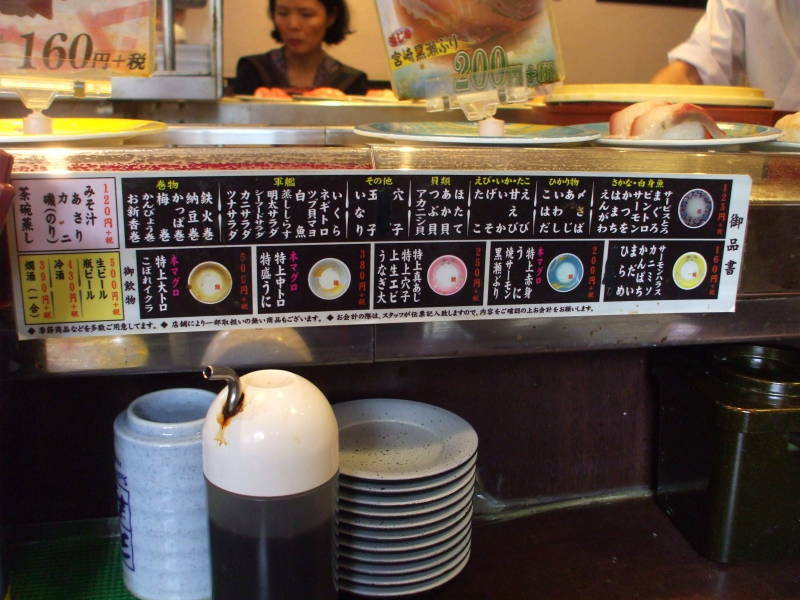 Kaiten-zushi, literally "rotation sushi", often called "conveyor belt sushi", is a popular and inexpensive form of sushi restaurant. 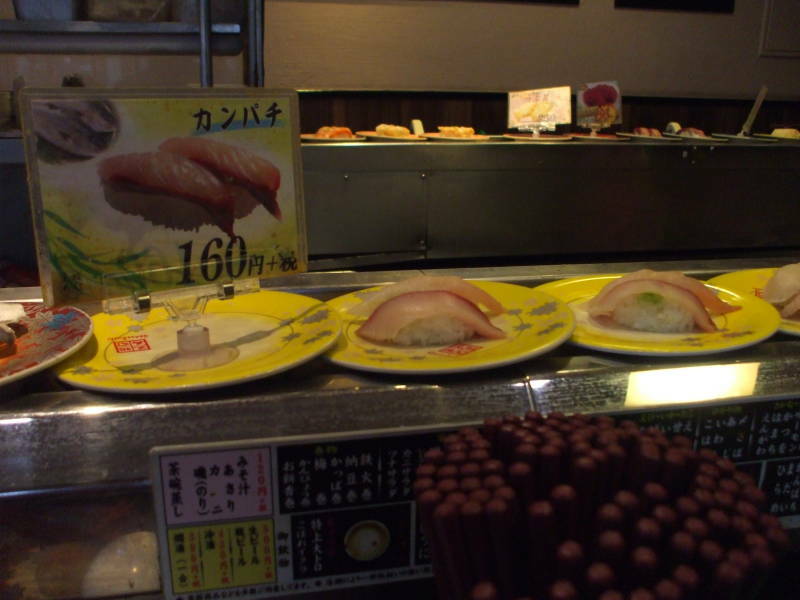 They're also called kuru kuru zushi, or sushi-go-round, and sushi train. 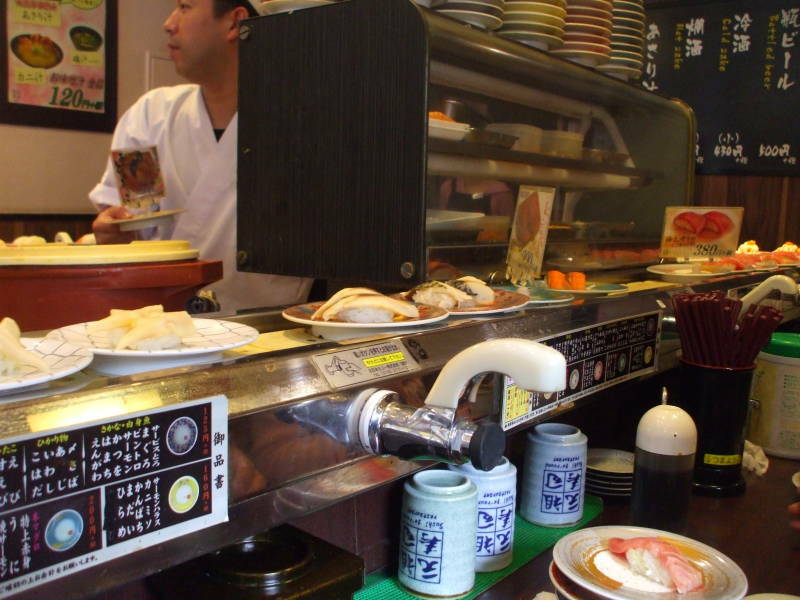 Plates of sushi are placed on a conveyor belt that carries them past every seat. You simply pick off what you want when it comes past. You stack your plates. At the end your bill is calculated by adding up the costs of the plates. The plate's color or possibly its pattern or shape indicates the price. There may be signs standing on or between plates on the belt, but those are more to catch your attention and promote items. There are canisters of wet wipes, containers with はし or hashi (chopsticks), soy sauce, wasabi paste, gari or thinly sliced pickled ginger, green tea powder, and stoneware mugs for the tea. The white spigot with a black rubber button dispenses hot water into the tea cups. 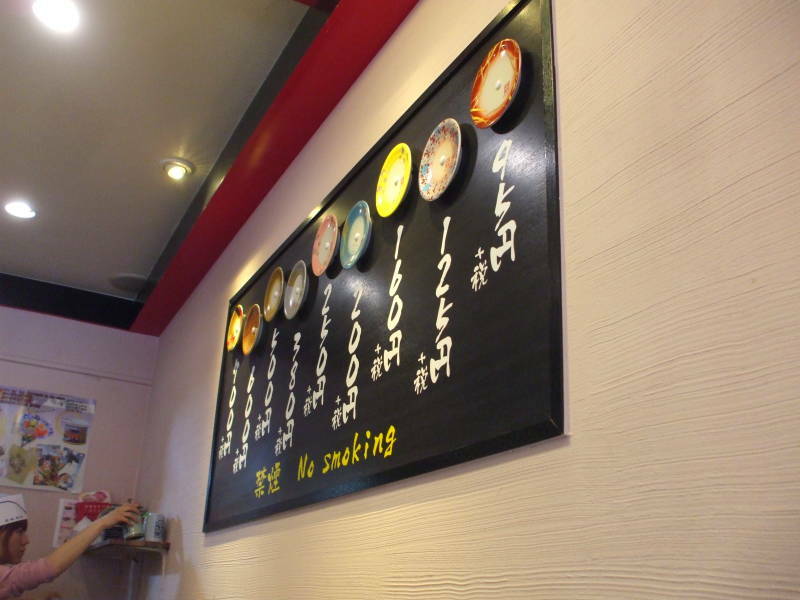 A small panel on the counter near your seat may show the pricing scheme, and there may be a large board on the wall with example plates and prices. 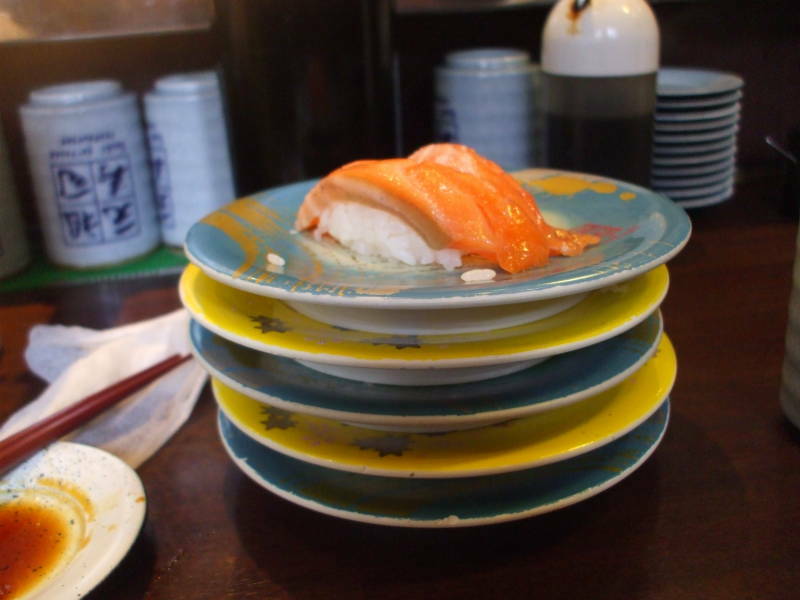 Most plates have two pieces of sushi. This one had plates starting at ¥95, most were ¥125 to ¥250. I ate my fill here more than once, never paying over ¥1000 or about US$ 8.80. The first sushi train restaurant opened in 1958. The inventor, who had trouble staffing his small restaurant and managing it himself, got the idea when touring an Asahi brewery. 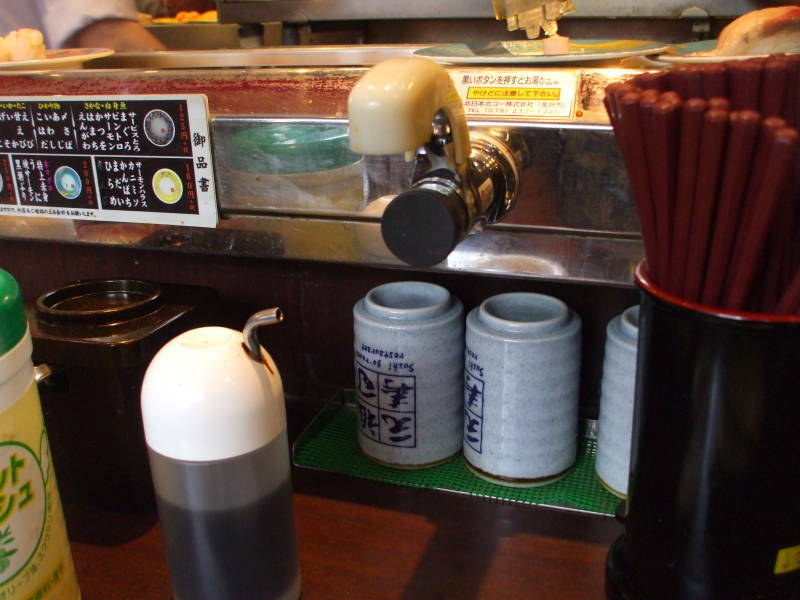 He built a conveyor belt system in his restaurant. His empire eventually expanded to 250 restaurants across Japan. But by 2001, the company was down to just 11 locations. The concept has risen and fallen in popularity several times. 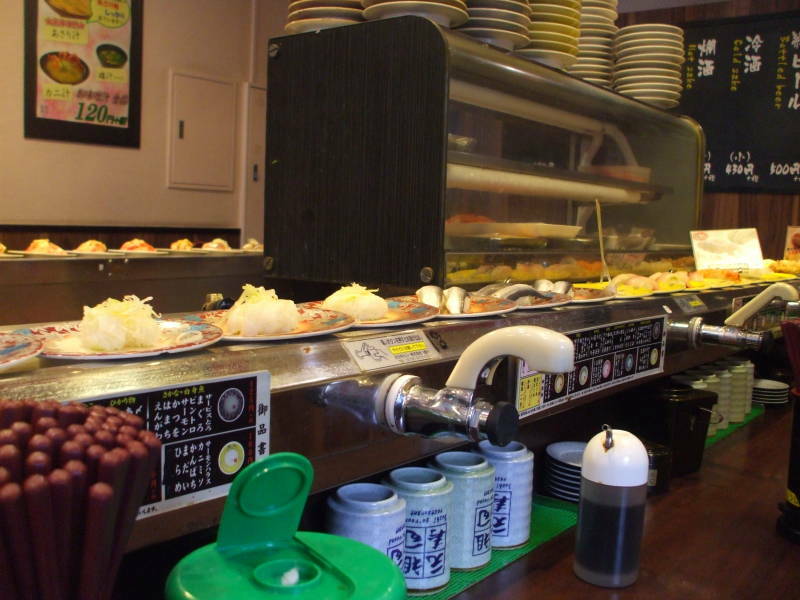 There was a sushi train boom in the early 1970s after many people saw one operating at the 1970 Osaka World Expo. 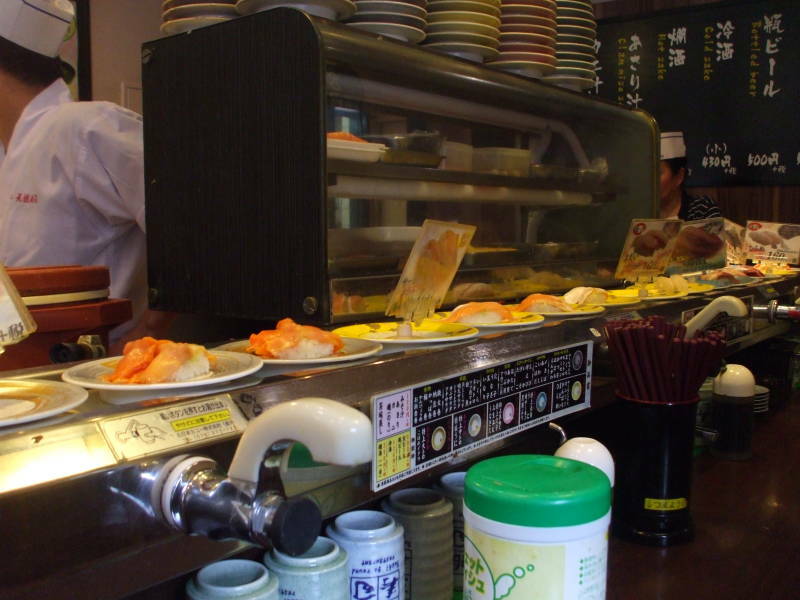 The sushi train soon became less popular, then boomed again in the early 1980s when eating out became more popular. Japan's economy went through a "bubble" phase through the mid and late 1980s. Prices of everything skyrocketed. Then the bubble burst in 1990-1991. The sushi train is back, thanks to the popularity of inexpensive restaurants in the post-bubble economy. 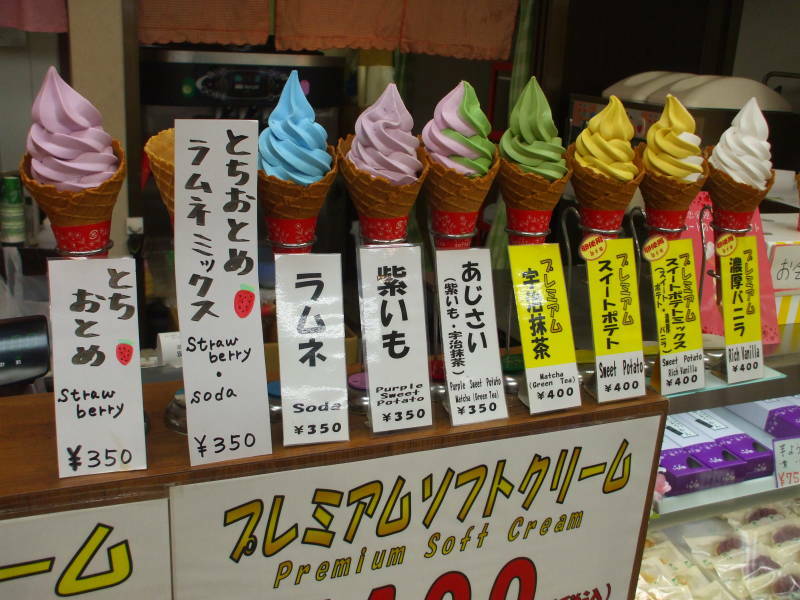 After the sushi train you may want to get some ice cream. 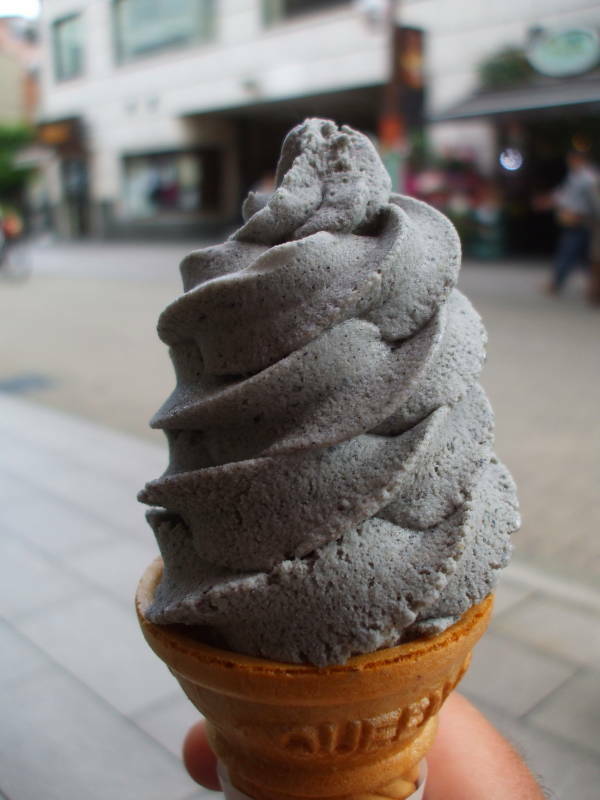 There is a wide variety of flavors, this grey soft-serve is made with roasted sesame. 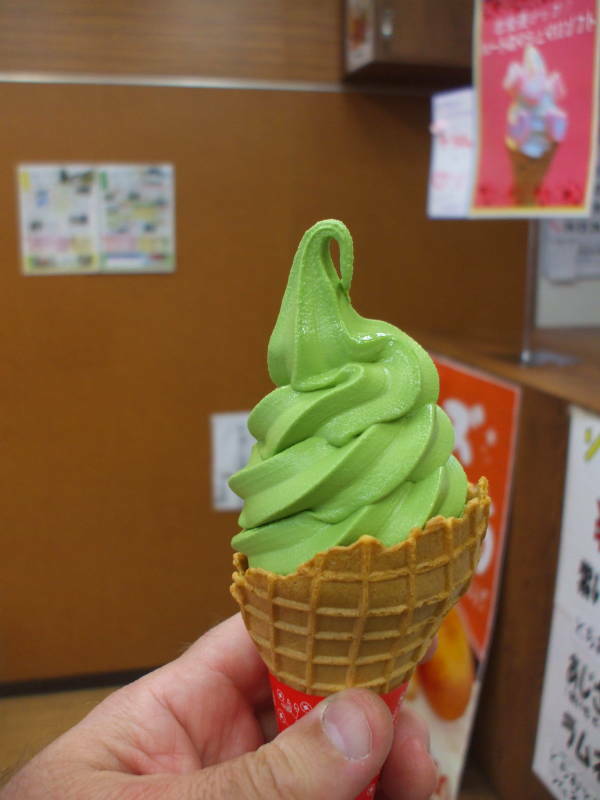 Matcha or green tea is a popular flavor. Or maybe sweet potato, or purple sweet potato, or some of these flavors mixed together.